Data types are the representation of any data means which types of data we want to store in memory. Each and Every variable occupies how many bytes in memory is defined by data types. It is also known as Fundamental data types. It is predefined data types and directly used by the user. int: 4 bytes of memory is needed for the 32-bit compiler. Signed int means positive/negative integer values. Unsigned int means only positive integer values. Range of Unsigned int: range from 0 to 2^31 i.e. 0 to 4,294,967295. Range of signed int: range from -4294967296/2 to + 4294967295/2 i.e. -2147483648 to 2147483647.
short int: 2 bytes of memory is required for the 32-bit compiler. long int: 4 bytes of memory is required for the 32-bit compiler. It stores decimal point values. It needs 4-bytes of memory to store data. It needs 8-bytes of memory to store data. It needs 12-bytes of memory to store data. Program: Find out the range of Floating data types. It needs one-byte of memory to store a character. it means its return type is an int but parameter or argument in add function is nothing. it means its return type is void i.e add function cannot return any value. In the above mention program, the return type is int and parameters list is int a and int b. In the above mention program, the return type is void means it can't return any value. Size of data types is measured using the sizeof operator. 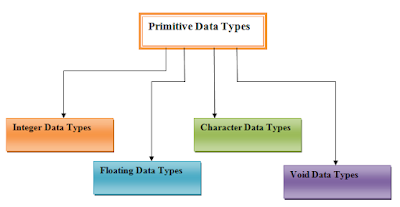 Derived Data types are derived from primitive data types. For example Array, String, Pointer, Functions etc. 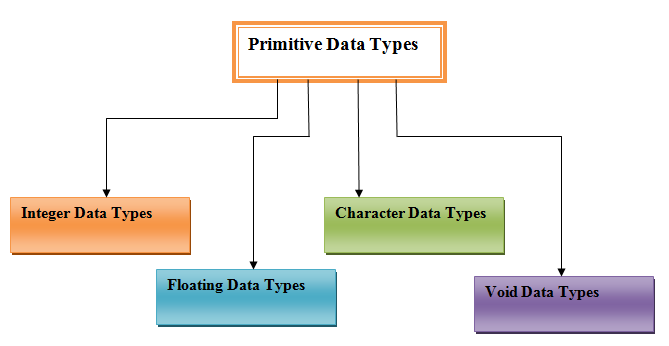 This type of data types is defined by the user. For example Structure, Union, typedef etc.